Kill, injure or take a wild bird. Possess a wild bird or the egg of a wild bird. Destroy or take an egg of a wild bird. Take, damage, or destroy the nest of any wild birds whilst the nest is in use or in the process of being used. There is additional protection for birds included in Schedule 1 of the Wildlife and Countryside Act 1981,which cannot be disturbed whilst in or near their nests (including their dependent young). Please note that the nest sites of white tail eagles, ospreys and golden eagles are protected through out the year. Advertise or sell any wild bird or its eggs. Exhibit wild birds in a competion, except under licence and fitted in a close ring as provided by regulation. To use prohibited methods to take, injure or kill a wild bird except under licence. Prohibited methods, include bird poisoning, shooting a bird with an airgun, blinding or maiming, snares and chemical wetting agents. Please note that the Wildlife and Countryside Act 1981 has been amended to implement the provision of the EC Birds Directive. This means that the protection afforded by the Act now extends to all bird species resident in, or visitors from member states of the European Union. 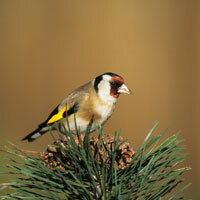 In effect, a wildbird that was resident say in Poland would be protected by the Act, if it appears in the UK. The grant of General Licences to owners or occupier of land, or people with permission from them. General Licences (issued by DEFRA) apply when it can be shown that the pest species will pose a threat to public health and safety, air safety or are causing serious damage to growing crops. These pest species include carrion crows, feral pigeons and jackdaws. Treatment of injured birds. You are entitled to pick up an injured wildbird and nurse it back to health, provided you can show that you did not cause the injury. You must release the bird back into the wild as soon as it recovers. The mercy killing of a seriously injured bird if it is unlikely to recover. The grant of a general licence for the sale or exhibition of a wildbird provided it has been bred in captivity and is properly ringed under relevant regulations. Authorised persons to kill a wild bird listed in the General Licences provided they can show that the action taken was for the purposes of public health or safety, disease prevention or air safety. Kill or injure a protected specie. To take, capture or keep a protected specie. To destroy, damage, disturb or prevent a protected specie from having access to its place of shelter. Protected species include bats, water voles, dormice, otters, red squirrels and pine martins. These species and others are protected under schedule 5 of the Wildlife and Countryside Act 1981. To disturb bats or their roosts, except if they are in a living area of a house like a bedroom or dining area. To sell, advertise for sale or trade in protected species or in any product derived from it. To use prohibited methods to take, injure or kill a protected specie, except under licence. Prohibited measures include animal poisoning, explosives, sound recording decoys, dazzling device or other forms of artificial lightening and explosives. To hunt a wild animal with a dog. As with the case of wild birds, there are some exceptions to the general rules.You are permitted to take an injured animal and nurse it back to life, but must release it back into the wild, as soon as it recovers. Appropriate authorities are also entitled to carry out measures which ordinarily would be prohibited under legislation, if such measures would protect public health and safety, prevent the spread of disease or are necessary for the development of science, education or conservation or will help prevent serious damage to agriculture, property and fishery. Natural England, Countryside Council for Wales or their counterparts in Scotland or Northern Ireland must be consulted before any of these measures are carried out. Pick, uproot or destroy a protected wild plant. Sell or advertise for sale a protected wild plant. For other wild plants (other than protected species), it is an offence to uproot them, unless this was done accidentally or authorised by the owner or occupier of the land, or by any person acting for them. Some of the wild plants protected under UK law are also protected by European law. Under European law, you are not allowed to collect, cut or damage such plants. Acts normally prohibited under wild plant protection legislation would be permitted, if it can be shown that they are required for the purposes of science, education, conservation, photography or for disease prevention, to protect public health or safety or to prevent serious damage to agriculture, fishery or property. Protected plants can also be sold under a licence obtained from an appropriate authority.